Thank you to Safeway and Albertsons for sponsoring today’s post. As always, all thoughts and opinions are my own. 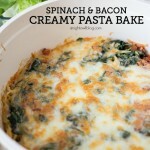 This Spinach and Bacon Creamy Pasta Bake is a delicious and easy weeknight meal the whole family will love! Hi friends! 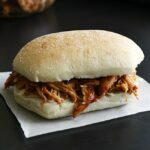 It’s summertime and the kids are home and now you have multiple meals to make for them each and every day. One thing that I love about summers is the relaxed schedule, allowing me more time to do things I love, like trying new meals in the kitchen. 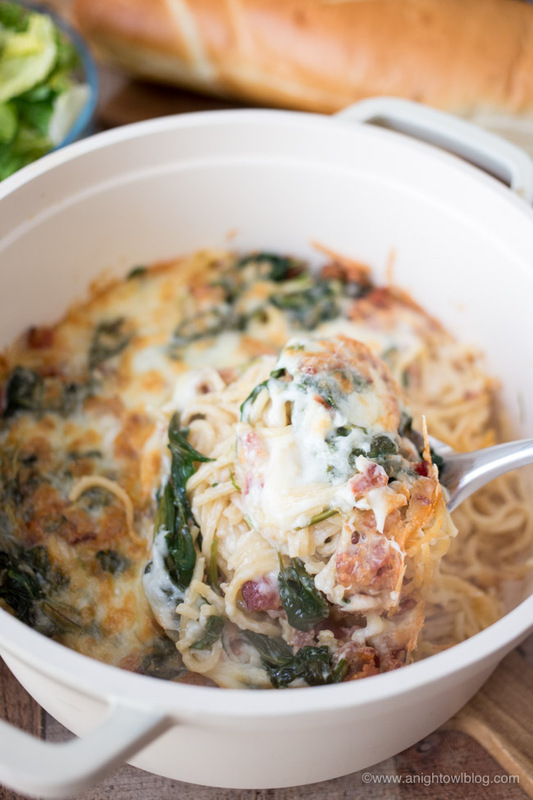 And today we’re sharing a new to us dinner that the family just raved about – this Spinach and Bacon Creamy Pasta Bake! 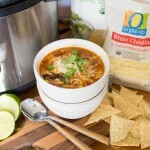 We started out with affordable, quality Signature products from our local Safeway. The Signature line, which is available exclusively at Albertsons and Safeway stores, includes more than 4,000 items – from coffee to juice, soup to cereal, fresh produce to fried chicken, and delicious prepared foods to trusted home staples – all with a 100% money back guarantee. For this recipe we used Signature Farms® Hickory Smoked Bacon, Signature SELECT™ Four Cheese Alfredo Sauce and Signature Kitchens® Spaghetti. I buy my Signature products at my local Safeway store, and you can also find them at all Albertsons Companies grocery stores, including ACME Markets, Jewel-Osco, Vons, Pavilions, Randalls, Tom Thumb, Shaw’s, Star Market, United Express, United and Carrs/Safeway. 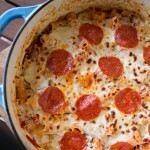 For this easy and delicious pasta bake recipe, simply start by cooking your Signature Kitchens Spaghetti for 9-11 minutes in boiling water, according to the directions on the box. While your pasta is cooking, chop 4-5 slices of your Signature Farms™ Hickory Smoked Bacon and add it to a large non-stick pan. 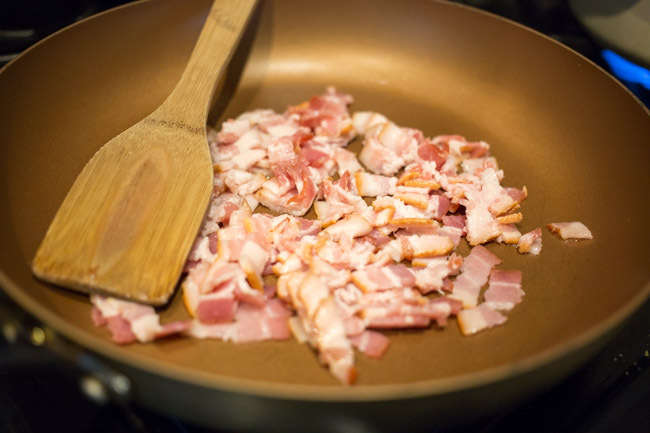 Cook the bacon until almost crispy then transfer to a plate with paper towels to drain off the fat. At this point your spaghetti is likely done. Drain the water from your pasta and rinse with warm water. 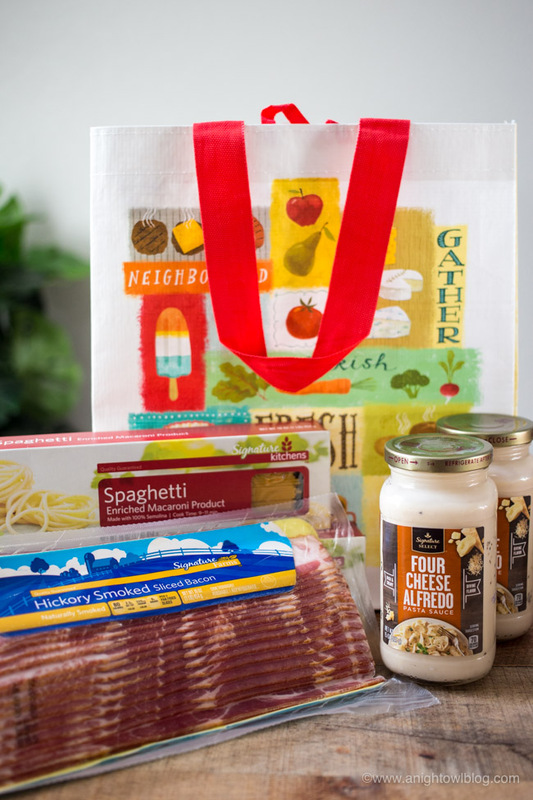 Add spaghetti back to your pot and add in your jar of Signature SELECT™ Four Cheese Alfredo Sauce. Cook through on medium heat. Now back to your non-stick pan. Leaving some of the remaining bacon grease in the pan, add 3-4 cloves of chopped garlic cloves and 2 cups of fresh spinach to your pan. 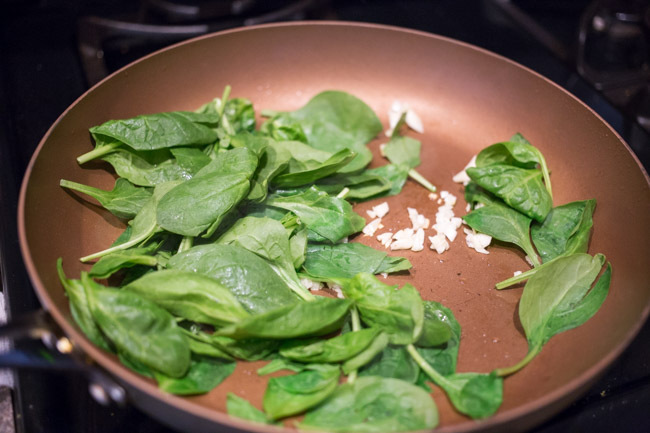 Cook until spinach is wilted. Add bacon back to the pan and stir. 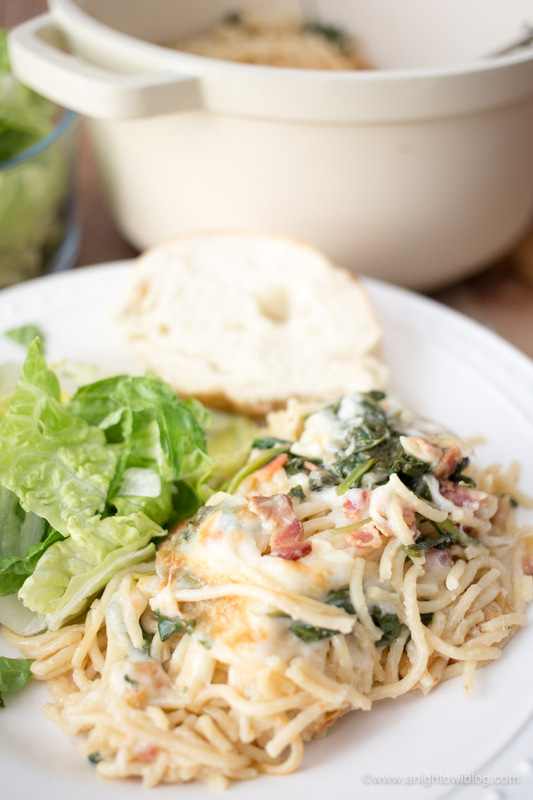 Top your pot of spaghetti with alfredo sauce with bacon and spinach. Then top the bacon and spinach with 1-2 cups of mozzarella cheese. Transfer pot to the oven and bake at 350 degrees for 15 minutes. After 15 minutes, switch your oven to broil and broil on high until the cheese bubbles and browns. 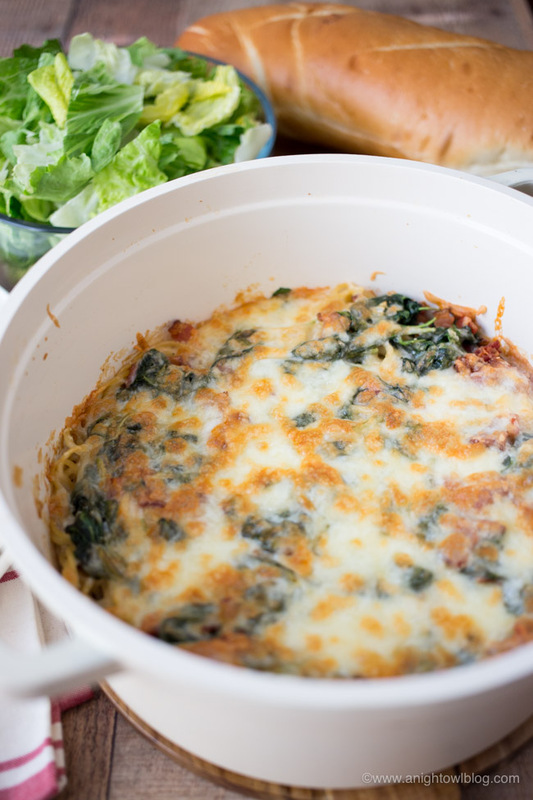 Remove your pot from the oven and your Spinach and Bacon Creamy Pasta Bake is ready to serve! I don’t know about your family, but when we have pasta for dinner, I always like to a pair it with a simple salad and toasted French bread. 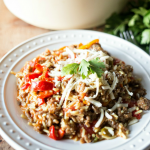 And there you have it – a full meal that you’ll have on the table in just about 30 minutes! You can’t beat that. 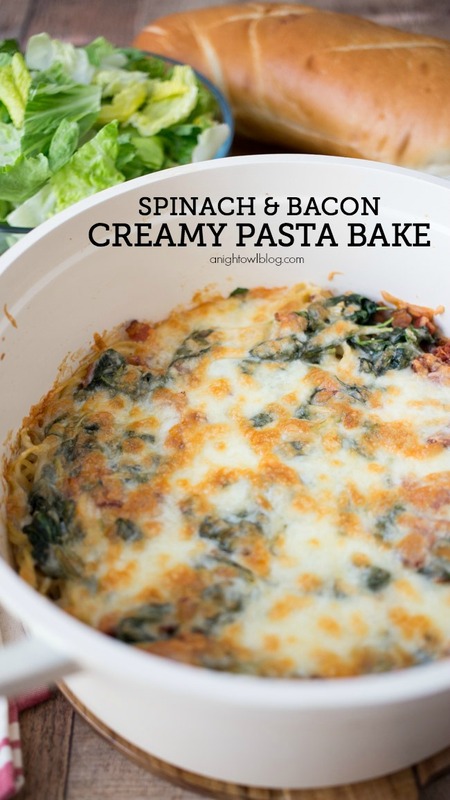 So head down to your local Alberstons or Safeway store today and grab what you need to make this delicious and easy Spinach and Bacon Creamy Pasta Bake. Let us know what you think! Add your Signature Kitchens Spaghetti to an oven-safe pot of boiling water and cook for 9-11 minutes, according to the directions on the box. 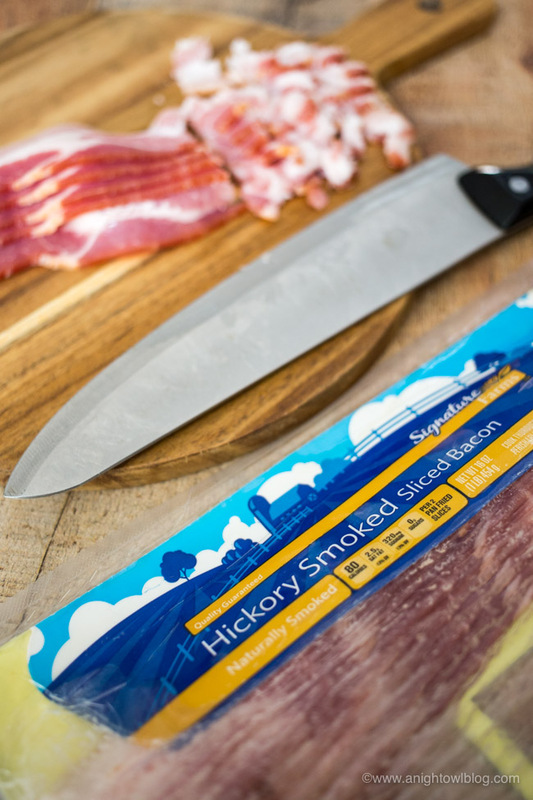 While your pasta is cooking, chop 4-5 slices of your Signature Farms™ Hickory Smoked Bacon and add it to a large non-stick pan. Cook the bacon until almost crispy then transfer to a plate with paper towels to drain off the fat. 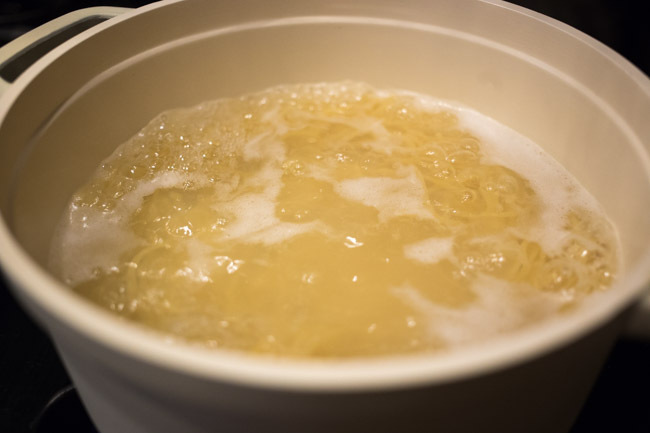 At this point your spaghetti is likely done; drain the water from your pasta and rinse with warm water. 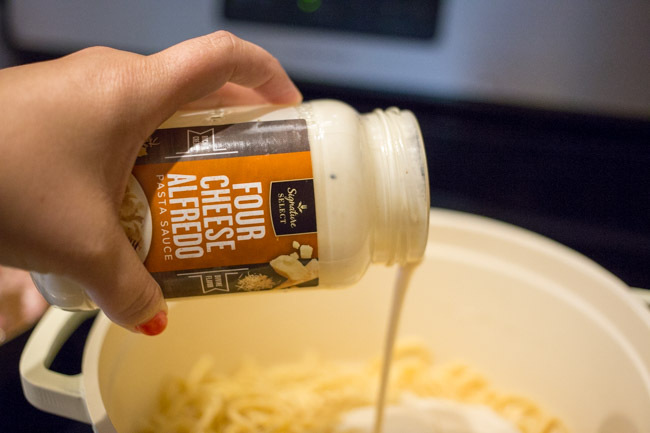 Add spaghetti back to your pot and add in your jar of Signature SELECT™ Four Cheese Alfredo Sauce. Cook through on medium heat. Now back to your non-stick pan; leaving some of the remaining bacon grease in the pan, add 3-4 cloves of chopped garlic cloves and 2 cups of fresh spinach to your pan. Add bacon back to the pan and stir. 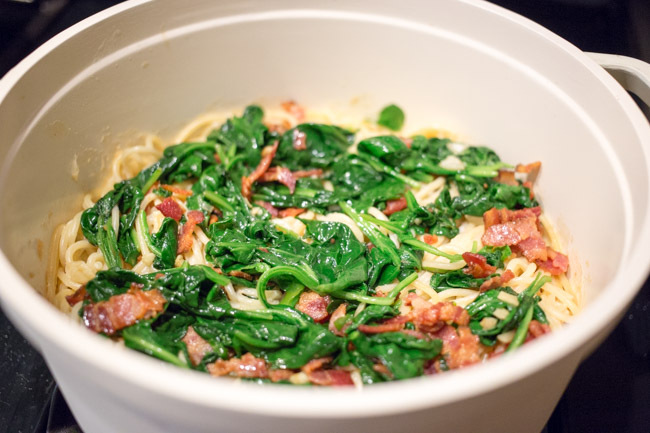 Top your pot of spaghetti with alfredo sauce with bacon and spinach. 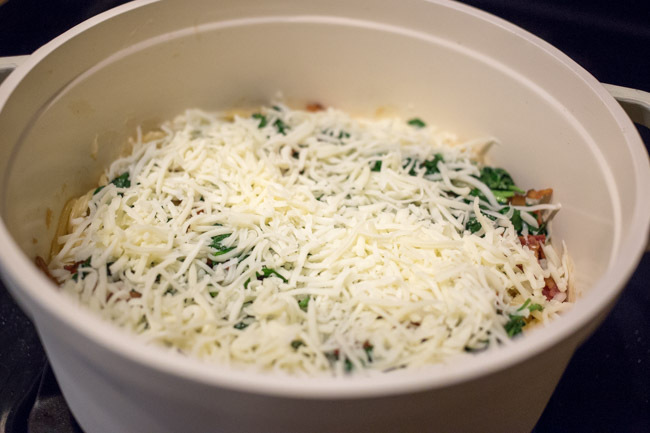 Then top the bacon and spinach with 1-2 cups of mozzarella cheese. Transfer pot to the oven and bake at 350 degrees for 15 minutes. After 15 minutes, switch your oven to broil and broil on high until the cheese bubbles and browns. 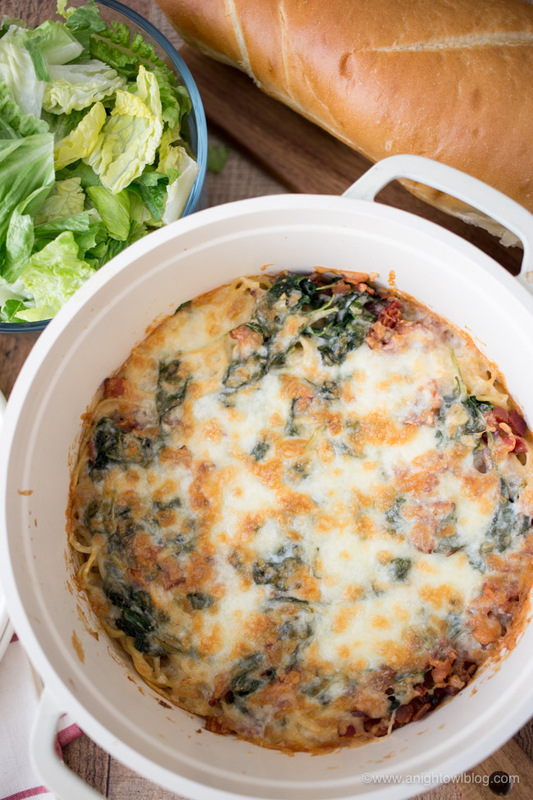 Remove your pot from the oven and your Spinach and Bacon Creamy Pasta Bake is ready to serve!